Software Cost Estimation – finally a real profession! Estimation maturity processes on average are still quite low in the Software industry. Large sums of money continue to be wasted because projects were not estimated professionally, resulting in cost and schedule overruns. One of the issues across all of industry is the fact that the software cost estimator is often not a recognized profession. In many organizations, estimates are based on experience and opinions of biased human experts, instead of being based upon relevant historical data and parametric models. Nesma and ICEAA (International Cost Estimation and Analysis Association) are working together to create a training curriculum and certification for ‘Software Cost Estimator’, a professional role for estimating software related activities and products. In cooperation with several supporting organizations, including ISBSG, and professionals in the industry, Nesma and ICEAA have been working together to develop a Software Cost Estimation Body of Knowledge (sCEBoK). In line with the training and certification programs ICEAA already has for cost estimation, the goal is to develop a training and certification program specifically for the software cost estimator. The plan is to have the first professional software cost estimators certified next year at the ICEAA conference in May 2019 in Tampa, FL and at the IWSM conference in November 2019 in Haarlem, the Netherlands. Visit the new Nesma website! Nesma invites you to contribute as speaker to the annual autumn conference on 15 November 2018. If you would like to share your experiences, thoughts, research results or other information on the theme: “AGILE DELIVERIES; ESTIMATES OR NO ESTIMATES? THAT IS THE QUESTION”, please send an abstract of 150 – 200 words before 21 September 2018 to: conference@nesma.org. For speakers, no fee is required for the event and the event dinner. CNMES18 – The National Congress of Measurement and Estimation of Software will take place on September 11th 2018 in Mexico. We look forward to seeing you in Mexico!! The New Release of the ISBSG Data is Coming! ISBSG is excited to announce the new release of the Development & Enhancement (D&E) data in January 2018. ISBSG Corporate subscribers will be sent the new release of the data, as part of their subscription. Find out how you can enjoy the benefits of a Corporate Subscription – click here. Would you like to know how the ISBSG D&E data can help improve the planning and estimation of your IT project? Browse now. We are pleased to announce a generous discount for customers who wish to renew their D&E Data licenses. D&E Data License renewals will now cost $1,800 (AUD), which is a 40% discount off the regular price of $3,000(AUD)**. This offer applies to renewals that occur immediately after the expiry of the previous license. **Note: D&E Data Licenses will increase in price to $3,000 at the 1st January 2018. With this in mind, we would like to expand our growing collection of Agile projects in the ISBSG Data Repository. We invite you to submit your Agile projects to us. We guarantee your anonymity and offer ‘rewards’ for submissions of Agile and all other projects. For information on how to submit your data to ISBSG, click here . ISBSG invite you to browse and download presentations from the 2018 Beijing IT Confidence Conference. These papers and articles were presented by experts from the IT Metrics industry from around the world. ISBSG has created a new section of the website dedicated to Agile called “Agile Corner“. A recent addition is a free report on How to Estimate the Required Team Size of Agile Teams . This is the first in a series of tutorials on how to use ISBSG data for processes regarding Agile software development. a few productivity measurement myths busted. ISBSG has 169 Agile projects in the Development and Enhancement Repository. The table at the bottom of the dedicated Agile Corner shows the breakdown by Language and Industry Sector. ISBSG data helps you to make better decisions, based on objective data instead of subjective opinions. 10% discount on all ISBSG products and services. The 2017 IT Confidence Conference was hosted by Gold partner China Software Process Improvement (China SPI) during September in Beijing. Presenters from IT Metrics organisations made presentations on topics such as project planning, estimation and cost-saving. View all 2017 Confidence Conference Presentations. René Notten, CEO of Metrics Quest, looks at this important issue. He briefly discusses strategies that can be used to improve the outcome of your project. Refer to article written by René: Percentage of Successful IT Projects. ISMA14, the IFPUG conference event celebrating our 30th anniversary, was held from September 13-15, 2017 in Cleveland, OH, USA. Three workshops and a full-day conference, featuring industry advancements with Function Points and SNAP Points, led to lively discussions and networking opportunities. Measurement guru Capers Jones’ enlightened us with research findings from his latest FP-based book. He challenged us to think beyond traditional measures, and announced that ISMA14 was his” swan song” (final public appearance). Attendees were impressed with both the array of workshops (early project estimation using Function Point (FP) Analysis and SNAP, and the application of FP rules to new, emerging technologies) as well as the lineup of global speakers. IFPUG’s bylaws were officialized in 1987 in Ohio, USA (now headquartered in NJ, USA). Returning to our roots in Cleveland, was a homecoming of sorts. IFPUG, as one of the first formal and mature measurement organizations has stood the test of time> It has inspired many other Functional Size Measurement Methods and measurement groups since its inception. The IFPUG method itself was the first FSMM to be published as an ISO/IEC standard, and since then, another 4 ISO/IEC conformant methods have been standardized and published by ISO/IEC. A joint paper on how to address agile development using functional size measurement. These two results show how a spirit of collaboration between IFPUG and other measurement organizations holds great promise for advancements in software measurement and the mainstream adoption of functional size measurement. As we round out 2017 as the International Year of Software Measurement (#IYSM) and IFPUG’s 30th anniversary, we are thankful for the support of our members, as well as our colleagues and friends at ISBSG and other measurement organizations. Their friendship and support are important to the growth of Functional Size Measurement globally. Please consider joining us for the next ISMA (International Software Measurement and Analysis) conference (#ISMA15) scheduled for Rome, Italy from May 8-11, 2018. John Ogilvie, ISBSG CEO, presented at the conference on “Using functional sizing to improve business success” and conducted a workshop on “Effective Applications Development Benchmarking”. Benchmarking the Applications Development, Maintenance and Support (AD/M) Environment can potentially provide significant insights into the performance of IT processes and identify how and where they can be most effectively improved. However, many organisations initiate a Benchmarking Activity, without first fully determining the objective of the benchmark, the benefits they hope to achieve, or establishing the criteria by which projects and applications will be selected and compared. This Workshop explores the reasons why organisations choose to benchmark. It identifies the potential benefits of benchmarking, and highlights the pitfalls of failing to appropriately plan the benchmarking activity or introduce rigor into the benchmarking process to ensure its success. Click here to view the workshop materials. ISBSG and China SPI intend to support each other in data collection and analysis. China SPI is now the official data and analysis partner of ISBSG in the greater China. Both parties will support each other in data collection initiatives, data analysis and the publishing of new analysis reports. China SPI will also translate the current special analysis reports of ISBSG into the Chinese language. ISBSG is confident that this partnership will result in a significant increase in available data in the existing repositories and in special analysis reports. ISBSG is facilitating its collection of data. This is assist people who want to submit data, but don’t wish to go through the lengthy data collection questionnaires on paper. Short versions of the questionnaires are now available online! If you have some project data, please submit and get a free benchmark report in return! Review the New Developments or Enhancements survey. Review the Maintenance & Support survey. Data can also be submitted in tool formats, such as QSM SLIM datamanager, SEER_SEM database and even plain Excel files. Check for more ways to submit project data, for instance for bulk submissions. ISBSG is currently investigating the creation of additional data collection questionnaires and repositories to better service the needs of the industry. We are planning to start a ‘technical metrics’ repository, where technical metrics of source code, measured with tools like Sonarqube, CAST, SIG, Omnext and others are stored in a standardized way, together with the main application characteristics. This will enable people to benchmark the results of software source code quality measurement against the industry. Project costs can be analyzed from two perspectives: cost per function point, and cost per hour. This report analyzes the projects in the ISBSG Development and Enhancement Repository (March 2016 Release) that provide cost data, from both of those perspectives. For this report, we have focused on 732 projects in the Repository, for which the size, effort and cost data are comparable and reliable. Purchase the Software Project Costs and Hourly Rates report now. The 2017 IT Confidence and ISBSG workshop will be hosted by Gold partner China Software Process Improvement (China SPI) in September in Beijing. ISBSG is looking forward to return to China 9 years after the successful event in Nanjing (2008). The Call for Presentations and the IT Confidence 2017 website with all information regarding the event will be published soon. We are pleased to announce that the COSMIC organization joined the ISBSG as a Bronze Partner. COSMIC is the organization that created and maintains the COSMIC functional size measurement method. COSMIC is one of the six functional size measurement methods that comply to the ISO/IEC 14143 standard for functional size measurement. Currently the ISBSG ‘Developments & Enhancements’ repository contains about 500 projects measured in the COSMIC method and we are confident that the partnership will result in a significant increase of this number. For more information about the COSMIC organization and the method, please visit the COSMIC website. In 2013, ISBSG, Capers Jones and Reifer Consultants analyzed the impact of software size on the productivity of a project. This revealed the factors that can provide economy of scale. Now ISBSG has published a follow-up report that analyzes the impact of software size on productivity based on 1139 competed projects. It turns out that there is a clear statistical correlation between project size and productivity. This is is extremely helpful for project, release and (sets of) sprints estimation or benchmarking. This analysis report can now be purchased against a discounted price of only 29 AUD. Today, the International Software Benchmarking Standards Group (ISBSG) announces the introduction of the Productivity Data Query tool as a replacement for the Data portal. Now it becomes easy to select a subset of productivity, speed and quality data from the ISBSG database. Organizations that don’t wish to buy the full database in Excel can now subscribe to the online Productivity Query tool. This is very convenient if you need to do a quick estimate for a project or if you wish to check the reality value of a project proposal. TRY IT OUT FOR 1 MONTH FREE. USE COUPON “pdq-month-trial” AT THE CHECKOUT. Step 1 – Enter the filters for your project. Then in step 2 a selection can be made on the dataset by selecting the most appropriate project attributes. 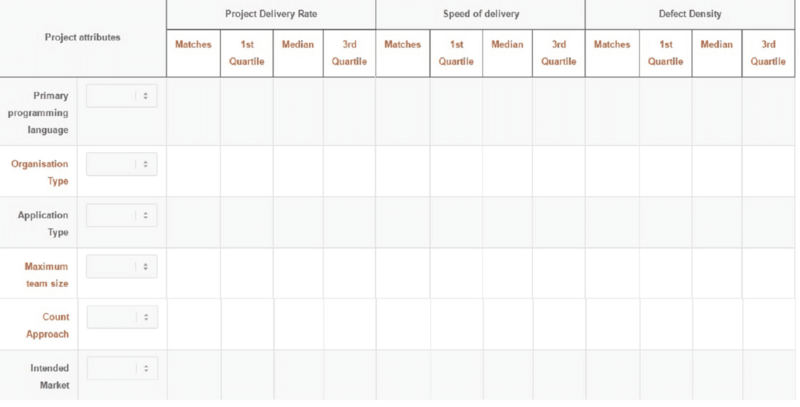 The number of matches is shown, as well as the 25th percentile, the median and the 75th percentile value for the Project delivery rate (hours per FP), the Speed of Delivery (FP per month) and the Defect Density (Defects per 1000 FP). Step 2 – Select all the attributes to include in estimate. After step 2, it is possible in step 3 to make a high-level project estimate based on the dataset selected in step 1 and all the project attributes selected in step 2. Step 3 – Enter your Function Point count and click Estimate. The projects selected for the result will contain ALL the attributes selected. Select wisely as selecting too many attributes may limit the amount of data to be included in your result. The PDQ tool helps project managers to estimate projects, releases and/or sets of, using industry data and international standards for functional sizing. Additionally, it becomes easy to assess the reality value of software development proposals and benchmarking completed projects. ISBSG is facilitating its data submission process for people who want to submit data, but don’t wish to go through the lengthy data collection questionnaires on paper. Short versions of the questionnaires are now available online! If you have some project data, please submit and get a free benchmark report in return! Until now there were a few differences between the ‘regular’ D&E repository and the D&E repository that the corporate subscribers get as part of their corporate subscription. The main difference being the number of data fields issued in the release. Starting 2016R1 that was just released, these differences have been removed, which means that now everybody will get the full repository with all the fields that can possibly be issued. This affects all data points that are present in the repository, so also the projects that were released earlier without these fields. Read about more about the ISBSG D&E data. From September 7 until September 10, the annual ISBSG workshop was held in Los Angeles, USA. Representatives of members from all over the world discussed the ways ISBSG should operate in the ever changing world of software. One of the new services ISBSG is going to provide is an online productivity query tool, which can be used easily to estimate or benchmark a project based on size and industry data. This tool should be going live any time soon and will be announced through a separate newsletter. Restrictions in contributing to ISBSG? ISBSG wishes to understand what organizations restricts in submitting data to ISBSG. Could you please help us out by filling in the following short questionnaire? ISBSG is very proud to announce the partnership with China SPI. China SPI is a not-for-profit organization in Beijing (China) that provides an ecosystem for its members to improve IT and Software best practices in China. China SPI has over 2000 members in China and wishes to improve the maturity of the Chinese market when it comes to software project estimation and benchmarking practices using functional size measurement and ISBSG industry data. ISBSG and China SPI are going to work together to translate ISBSG materials and to collect data from the Chinese industry. As part of the new partnership, ISBSG president Harold van Heeringen gave a key-note speech at the annual international conference organized by China SPI. His presentation ‘Improve Estimation maturity using Functional Size Measurement and Industry Data’ helps China SPI to improve the software estimation and benchmarking maturity practices in China. Until now there were a few differences between the ‘regular’ D&E repository and the D&E repository that the corporate subscribers get as part of their corporate subscription. The main difference being the number of data fields issued in the release. Starting 2016R1 that was just released, these differences have been removed, which means that now everybody will get the full repository with all the fields that can possibly be issued. This affects all data points that are present in the repository, so also the projects that were released earlier without these fields. Get your copy of the full dataset here. In 2013, ISBSG started to organize a one-day conference aligned with the traditional yearly workshop. The name of the conference, IT Confidence, was chosen to stress the fact that the IT industry could actually get more confidence to deliver successful projects when using mature measurement and estimating techniques and relevant historical data. Since 2013 (Rio de Janeiro), 2 additional successful events were organized: 2014 (Tokyo) and 2015 (Florence). This year, the IT Confidence is going to be organized together with the Southern Chapter of the International Cost Estimating and Analysis Association (ICEAA) in Los Angeles. ISBSG Gold member Galorath is the host of the event which is scheduled on Wednesday September 7th. Find out more about this event and the Call for Papers/Presentations on the conference website. n order to shorten the response time for questions and orders, ISBSG has appointed a new front office and a new front office e-mail address. Please use the e-mail address frontoffice@isbsg.org for all ISBSG related questions and queries. Are government software development projects really less productive than non-government ones? Many people ask us if we have data of the differences between government projects and non-government projects in our repositories. A lot of people presume there are differences in productivity and are looking for data to confirm their assumptions. In fact, ISBSG collects this data and also whether the project is carried out in-house or outsourced. If you are interested in this, please check out the special analysis report Government and Non-Government Software Project Performance. 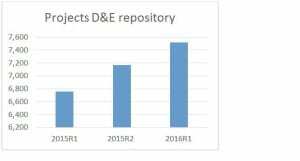 For the D&E repository, the number of new project submissions is quite steady. Especially corporate subscribers benefit from this, as they receive an updates repository any time a new version is released. 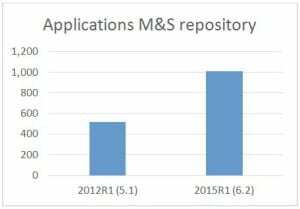 However, the M&S repository suffers from a lack of data submissions. ISBSG is now in the process of creating new repositories and associated questionnaires as well as easier ways to submit data for people and/or organisations. If you have any thoughts on how we should improve the data collection, especially in the application maintenance & support area, please let us know: frontoffice@isbsg.org. A new feature of the ISBSG newsletter is the ‘interesting statistic’. 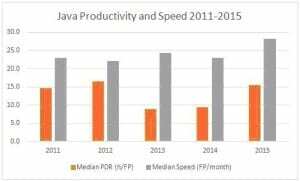 In this section, a brief analysis is carried out to see the trends in productivity (hours per function point), also expressed as Project Delivery Rate (PDR) and the speed of delivery (Function points delivered per calendar month) of Java projects. The median PDR of the completed Java projects in the repository is typically 14-16 hours/FP, but in 2013 and 2014 it dropped to under 10 hours per FP (meaning a better productivity these years), only to go up again to the usual level in 2015. The average speed is typically 22-25 Function Points per calendar month, but remarkably enough rose in 2015 to 28 hours per month. So, in 2015 the PDR got worse, but the speed went up! Possibly this effect can be explained by the increased adoption of agile development methods in the industry, where development speed is high, but there usually also is some rework after each sprint. Read how we can help you with the estimation of your project.